IBM® z/VM® 6.2 introduced significant changes to z/VM with a multi-system clustering technology that allows up to four z/VM instances in a single system image (SSI) cluster. This technology is important because it offers you an attractive alternative to vertical growth by adding new z/VM systems. In the past, this capability required duplicate efforts to install, maintain, and manage each system. With SSI, these duplicate efforts are reduced or eliminated. Support for live guest relocation (LGR) allows you to move Linux virtual servers without disrupting your business or incurring loss of service, thus reducing planned outages. The z/VM systems are aware of each other and take advantage of their combined resources. LGR enables you to relocate guests from a system requiring maintenance to a system that will remain active during maintenance. A major advantage for DB2 v10 customers is that using z/VM 6.2 does not require any changes to existing DB2 structures. This remarkable benefit is due to the fact that DB2 v10 is installed as part of the LInux guest on z/VM and is fully integrated into LGR. This allows you to smoothly move DB2 v10 when you move Linux virtual servers, without interrupting either DB2 v10 or z/VM operations and services. 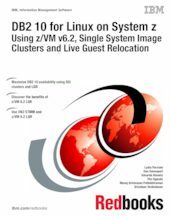 This IBM Redbooks® publication will help you understand how DB2 10 on Linux for System z® behaves while running on a z/VM that is being relocated using z/VM’s 6.2 Live Guest Relocation feature. In this book, we explore memory management, the DB2 Self-tuning memory manager feature, time synchronization, networking, and storage and performance considerations with regards to relocation. We also offer some best practices found during a live guest relocation for DB2 v10.